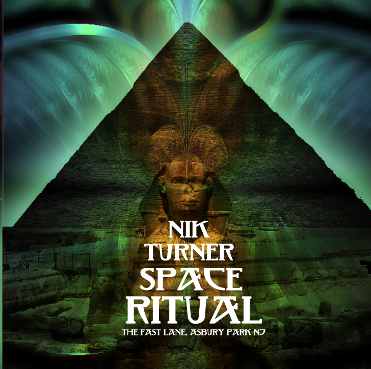 Really sweet soundboard recording here of a show from the Nik Turner Space Ritual 1994 tour that Helios played on. This one takes place at a venue called the Fast Lane on the East coast - Asbury Park, NJ on Friday night, January 28th 1994 - crisp clear sound straight from the board. Helios plays lead guitar throughout the show - with a bit of rhythm guitar as well - adding his signature fuzz and unique guitar tones that we all love and crave. Helios also plays 3 of his own songs on this - Hyperventilation, Throw Away The Rind, and Nirbasion Annasion. Just listen to the interplay with Nik Turner on his sax and Helios on guitar during the guitar solo on "Hyperventilation" - a nice moment onstage with 2 of the legends of psychedelia - listen on headphones even for the full effect! One of the greatest things about this is that we get some really nice improvisation from Helios on guitar with his leads and things..... just listen to the amazing little, groovy leads on "Thoth" in between Nik's verses, it's even danceable - brilliant improv from Helios there with feedback as well. 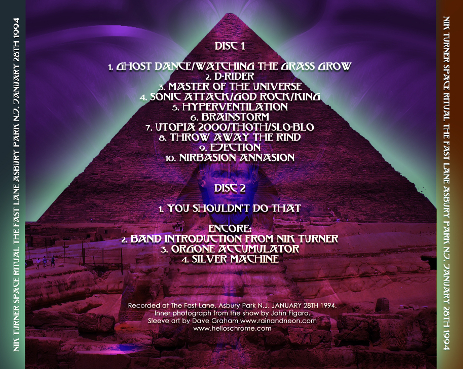 Now there was an official release of a different show from this tour - also an amazing recording, but the cool thing about this recording is that it's uncut - no songs cut out or edited - this is full sonic assault baby! This is a great recording that I thought should be available to all Helios fans out there. Enjoy it along with the amazing trippy Egyptian-esque artwork that fits so well with the show thanks to David Grahm!